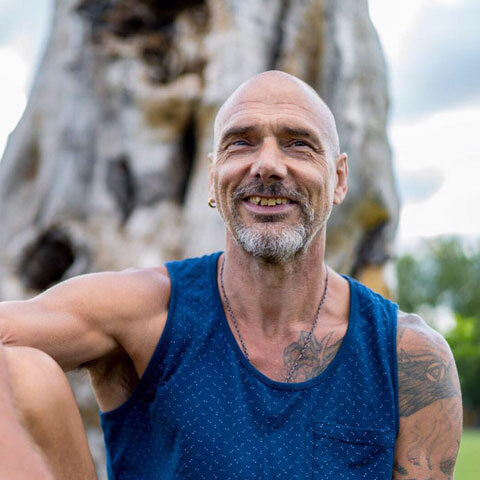 Christopher Gladwell has been practicing and teaching yoga for over 35 years and is a leading senior yoga teacher trainer from the UK. He has extensive practice and study with the Satyananda School of Yoga (12 yrs) and the Ashtanga Vinyasa system of Krishnamacharya and Sri K Pattabhi Jois (12 yrs), as well as other systems such as Iyengar yoga, Viniyoga, OkiYoga and Chi Kung. For the last 10 years he has been involved in Buddhist Tantric practices from Tibet as well as shamanic practices of the Native American peoples. The author of ten books, he runs yoga teacher trainings in Bristol, in between running workshops and trainings across Europe. He has extensive knowledge of the body, and has studied and practiced various physical therapies and body work including myofascial, structural bodywork. As a teacher of functional anatomy and physiology rooted in his early training as a biologist he brings this element of understanding in yoga to life. Chris is also a trained hypnotherapist, trainer in NLP and a professional coach with in-depth study and experience in psychotherapy which is an important aspect to his classes and teacher trainings. His teachings are a journey into real yoga, an in-depth study into mind, body, emotion and spirit. He offers an authentic opportunity to learn from someone who has thorough knowledge and experience of a broad spectrum of yoga practices. He teaches from first hand experience of the benefits of the physical aspect, and also how the healing potential of a holistic approach to yoga brings real joy, bliss and freedom into life. 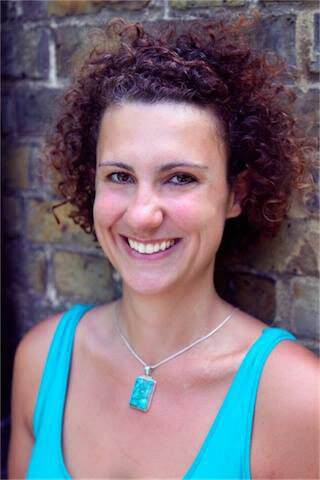 Emma Michael took her first yoga class over twenty years ago in her home city of London. She spent many years as a yoga practitioner, practising a range of styles including, Hatha, Ashtanga, Jivamukti and Iyengar. She has completed teacher training in Sivananda and Anusara yoga, as well as YogaWorks and Birthlight. Over nine years ago, she trained as a body worker in Thai massage and shiatsu and continues to offer shiatsu at her studio – The Centre in Nicosia, Cyprus. She holds a Bsc Hons in Psychology and a postgraduate training in Psychotherapy and Counselling, as well as training and extensive practical experience in mentoring and coaching. Two of the most important aspects of practice that she facilitates in her classes are self-awareness and self-acceptance. She is a grounding presence and teaches in a way that makes yoga as applicable to our lives as possible, helping her students learn how we can shed love and light on our shadows. Her background in Psychology, Psychotherapy and bodywork enables her to work holistically and authentically with her students and clients. Her classes are rooted in Hatha yoga and are deeply connected to conscious movement through gentle, static poses, as well as dynamic, challenging, flowing movements. She works a lot with pregnant women, clients with injuries and mobility issues, as well as psychological and psychosomatic conditions. She has continued to develop her prenatal work through studying with the Birthlight Trust in Prenatal and Postnatal yoga, as well as fascinating work with Suzanne Yates and the extraordinary meridians of Chinese medicine. She provides a safe space to deepen into the journey of the self and for the alchemy to happen. Yoga Sutras, The Bhagavad Gita, Shanti Parva, Religion and yoga, Tantric path - systemic and integral, Tantric path - senses, sense fields and yoga, Vijnana Bhairava Tantra. Respiration, musculoskeletal, circulation & vascular, neuroendocrine & stress, digestion, diet (incl microbial health), endocrine, brain and nerve health, brainwaves, neuroplasticity and wellbeing, fascia and kinetic chains, evolutionary biology. Asana: Surya Namaskar (Sun Salutations), standing, seated, twisting, hip opening, back bending, balancing & inversions for level 1 & 2 classes, alignment principles and its limitations, Injury management, strong daily practice, restorative practice. Pranayama: yogic breath, prana mudra, ujjayi, nadi shodana, kapalabhati, brahmari, anuloma viloma, bhastrika, sagarbha pranayama. Mudra and Bandha: The primary kaya, hasta and mano mudras and bandhas, how and why they work. Mantra: Daily mantra practice, sanskrit translation, bija mantras & the elements and more. Meditation: Mind mastery and mindfulness, Loving kindness, Vichara, Dharana, Dhyana, Samadhi, Guided meditations, Kundalini and energy meditations. Relaxation techniques: Yoga nidra, Restorative yoga, Accessing the parasympathetic through the breath, diaphragm, suboccipitals and more. Kundalini: Kriyas, chakras, nadis, chanting, pranayama, koshas, meditation. Ethics & the teacher/student relationship, power of presence, language & voice skills, Vinyasa krama and intelligent sequencing of your classes, reading the body, facilitation through adjustments modifications & using props according to individual need, hands on skills, how, why and when to demonstrate, key misalignments and injury risks, effective communications skills, verbal cues, student engagement, hands on practical teaching experience, marketing and how to run your yoga business. Yoga as personal responsibility, yoga as a tool for transformation, yoga and sexuality, life-energy and freedom, dream yoga, theories of psychology and psychotherapy - the spectrum of consciousness, how and why developing a daily yoga practice is important, taking yoga off the mat and integrating it into your daily life. Anatomy & physiology of trimesters of pregnancy and postnatal period, pelvic floor, how to adapt/cater for pregnancy and postnatal women in your classes, how to adapt poses and breathing, common complaints and injury avoidance. The dates of the course are set out below and will not change unless there are exceptional circumstances. It is essential that you are available to attend all days of the course to fulfil your requirements and graduate from the training. The course takes place at the The Centre in Nicosia, and the retreat location will be at The Afroditi Beach Hotel as part of the Engaged Yoga 2019 Retreat. The first module will be taught as a 7 night/8 day retreat and the course will finish with a long weekend, including Friday in which the final assessments and feedback will take place. The weekend hours are usually 9–6pm. Students must attend a private session (at 50% of the lead teachers' normal rates) with the lead teachers and are encouraged to follow this up with further sessions at a substantive discount. Students will also be given the opportunity to teach classes at The Centre and receive feedback on these classes. Students will also have discounted access to classes at The Centre and workshops with Christopher and Emma during the teacher training. We will also offer ongoing support and mentoring with one session free for each student around learning skills and strategies, presentation skills and teaching skills. This is subject to advance booking and availability. There will also be the opportunity to follow up with more sessions at a discount rate (50% of the lead teachers' normal rates) to make your learning and exam experience one of delight, rather than stress. Assessment from the lead teachers will be continual and throughout the duration of the course. Coursework will be issued after each session and usually includes: a written assignment, reading a text, maintaining an ongoing yoga journal about your personal experiences, teaching community classes and maintaining a regular personal practice. There will be two exams, 1) Philosophy & Ethics and 2) Anatomy & Science at the end of the course. There will also be a 1-hour final teaching assessment. On completion of the course requirements and attending 90% of the course of the Engaged Yoga 300hrs Teacher Training course you will receive a certificate from the Engaged Yoga Academy and are eligible to use “Engaged Yoga” for your classes and to describe your style of teaching. Chris & Emma are passionate about quality and integrity in yoga. For that reason the course is not registered with the Yoga Alliance. The Yoga Alliance (YA) is an association that offers a registration for teachers and schools. They are not a governing body and do not offer recognition of a standard in teacher trainings nor do they attempt to apply any kind of assessment or regulation of the standard of the trainings it registers. This means that the YA offers no accountability. The YA’s minimum standards are not enough for the Engaged Yoga Team to align with. What we offer is over and above the minimum requirements that a 300 hour teacher training registered with the YA needs to meet, as well as exceeding the minimum number of contact hours that is required. There is no requirement for mentoring, follow up or to what standard to set assessments, all of which Chris and Emma believe are fundamental for gaining a standard of excellence from our graduates. We are commitment to producing the finest teachers Cyprus has to offer, and we do not believe registration with the YA facilitates us to to that. This training is recognised by the Independent Yoga Network (IYN) of the UK to which Chris is a recognised senior teacher and elder.